Quilt Sandwich (or “sandwiching the quilt”): Refers to placing the three layers of the quilt, one- on- top of the other in preparation for sewing. The bottom layer, batting and quilt top are either put into a quilting frame or hoop or are laid on a table for stitching the three layers together. Hand Piecing: Hand piecing (or hand stitching) means that the blocks or pieces that make up the quilt top are sewn together by hand, NOT by sewing machine. 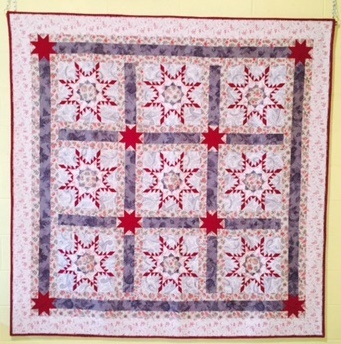 Many quilters choose to hand piece a quilt top, as it gives them a sense of relaxation. Many quilters choose to hand piece their quilt tops, as hand piecing is portable; you can take your sewing with you in a bag or box and sew wherever you are. There is no need to carry a heavy sewing machine with you to sew! You can hand piece a quilt top while you are at you son’s baseball practice, while you are sitting at the airport, or while you are recovering at home following surgery, etc. Hand Quilting: Hand quilting means that the three layers of the quilt sandwich are stitched together BY HAND using a “continuous running stitch.” The photo below shows what hand quilting stitches look like.